The Roman fort at Kendal, is both invisible these days, and almost impossible to get to. The buried remains are sited in a loop of the River Kent, to the South of Kendal on farm land adjoined to Watercrook Farm. The fort has been greatly reduced in height and form by years of ploughing and farming, and now consists of a faint almost indistinct square platform in the field. Even aerial photographs show very little of the fort's remain. Above. A view of the fort looking North West. The photo above, shows the most obvious remains of the fort. Just beyond the field wall, a dark green part of the field can be seen....this is the West end of the fort platform. Excavations at the site in the early 1930's and in 1944, discovered the North West gate, and established that the fort was probably built between 90 and 95 AD. It's thought that the original fort was then built in stone between 120 and 130 AD. A drought that hit the area in 1887, gave archaeologists of the time, a great opportunity to plot the outline of the fort when the field was dried out sufficiently for the outlines of walls and ramparts to become visible. Further excavations were undertaken in 1974\75 when further buildings were discovered. It doesn't appear that the full excavation report has ever been published, so information is pretty hard to come by. Apparently the remains of a Roman bath house were visible as late as 1908 on the site of Watercrook Farm. The remains consisted of underground cavities and the tips of arches and the remains of other structures. As far as I'm aware, these remains are no longer in existence. Above. Roman altar stone from Watercrook Farm. Above. Another Roman altar stone from Watercrook Farm. Above. Image in stone housed at Kendal Museum..again from Watercrook Farm. Above. A stone tablet from Watercrook Farm. Above. The Satury looking North West towards the Roman fort. 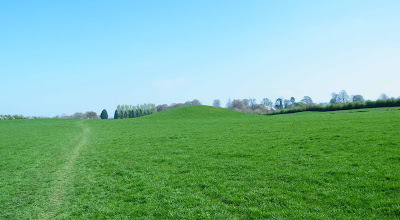 The Satury is a low mound of earth that can be found along the public footpath that runs South of the Roman fort at Watercrook. Local legend\tradition has it that this mound is related in some way to the Roman fort, but in all honesty there doesn't seem to be any archaeological evidence to support this. A document from 1774, tells us "On Sattury was found stones with mortar on them when it was ploughed." What this could possibly indicate though, I'm not sure. Other documents relate to the name, Sattury, as meaning the place of a Roman temple dedicated to the Roman god Saturn...though it's generally agreed now that the name Sattury could come from Old Norse, "saetrhaugr", meaning "the mound of the settlement". Above. Map of the fort, showing its proximity to the River Kent. Above. Map of the fort, showing the 1974 excavations. Above. A plan of Watercrook Roman Fort, showing buildings and streets. The fort, as mentioned above, is not accessible to the public, and though the field can be viewed from across the river, there really isn't much to see. As soon as I have more information regarding the items that were recovered from the fort, and that are now displayed in Kendal Museum, I'll post it here. The Roman Britain web site entry for Watercrook fort. 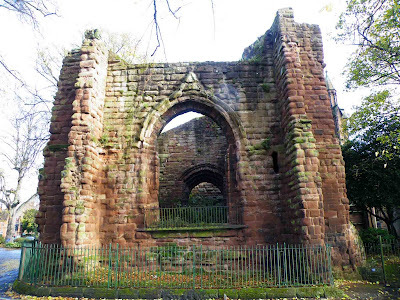 Situated to the South of the city of Chester, and only a few hundred feet from the North shores of the River Dee, the imposing Norman church of St John the Baptist is to be found, nestled behind the half excavated Roman amphitheatre. The huge Western tower of the old cathedral of Chester, whilst not built as a defensive structure, was used by Parliamentarian forces during the English Civil War against the Royalist garrison confined within the city walls. Initially used as an observation post, the church was almost transformed into a garrison or fortress towards the end of September 1645. Under Colonel Michael Jones and Major James Lothian, the Parliamentarian army overran and captured the Eastern outworks of the city, along with the Eastern suburbs right up to Eastgate. A cannon battery was established in the church yard, possibly with some lighter cannon being stationed on the tower's summit. From here, the Parliamentarian besiegers were able to bring cannon fire not only onto the city walls, but also beyond and into the very city itself. A breach in the walls was finally made on the 22nd of September, near to the Newgate, but it had taken over thirty cannon shots to do the damage. The Royalist defenders however, managed to fend off the assault, blocking the breaches in the wall with anything that came to hand. Charles I arrived on the 23rd with reinforcements to aid the city's defence. His army engaged the Parliamentarian forces the next day (24th September 1645) at Rowton Moor, where it was was soundly defeated. Charles left the city immediately. The Parliamentarian forces issued a summons for surrender on the 26th of September, but this was rejected. The battery at St Johns was re-enforced, with additional guns brought to bear on the city walls. The battery was used to destroy the defender's cannon on the North walls, and another breach was finally made. The guns at St Johns were used against the Dee Mills, Bridgegate waterworks and the South East corner of the city's walls, causing a great amount of destruction. The tower, in an old print from the early 1800, looks to be around one hundred feet tall, so would have offered the attackers an excellent view into and over the city. A few carefully stationed cannon here would have been well placed to pick and choose their targets within the city. Indeed, the commander of the Royalist defenders gave orders "for the pulling down of St John's steeple, which (in case the enemy should possess the suburbs) would be very prejudicial to the city as overlooking it all, and from whence (in the ensuing siege) was received our greatest annoyance" (thanks to www.chesterwalls.info) How right he was to be concerned. The mayor, upon whom the responsibility for demolition was bestowed, failed to carry out his orders, no doubt under pressure from the towns folk to preserve their parish church. The five month occupation of the church proved most destructive. Some reports state that all the church furniture and all of its memorials were shot up and destroyed and were in a state of desolation when the towns folk took possession of their church again. On the 8th of October, another attempt to storm the city was made, via several more breaches in the walls. After heavy fighting the attack was thwarted. No more attempts to take the city were made after October 1645. The Parliamentarian forces decided to sit and wait, occasionally engaging the defenders and attempting to persuade them to surrender. Packets of papers were shot over the city walls, encouraging the towns folk to surrender. When this failed, snipers were placed at the church tower's summit. From here they were able to take pot shots at anyone seen in the streets beneath them, and succeeded in shooting and killing Sheriff Randle Richardson. Finally, on the 31st of January the city of Chester surrendered, agreeing terms on the 1st of February. The tower stood for another two hundred and thirty six years, before finally falling down on Good Friday 1881. Above. Antique floor plan of the church, showing surviving buildings and ruins and remains. See the Cumbrian Churches blog for further information on the church.